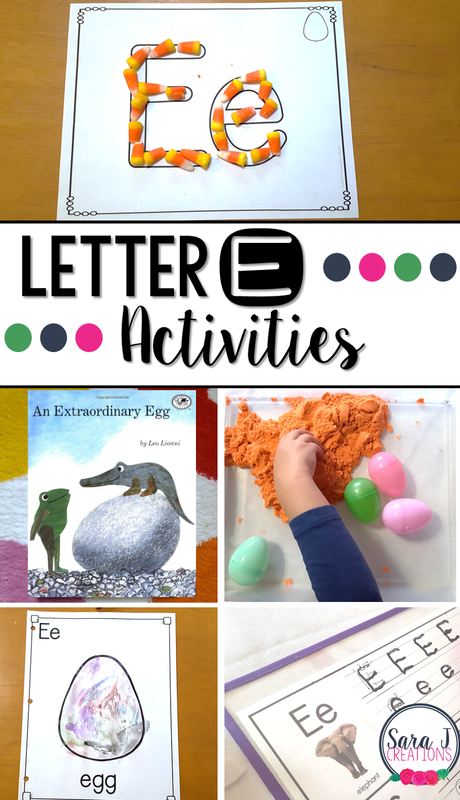 Preview: Letter E Activities that would be perfect for preschool or kindergarten. Sensory, art, gross motor, literacy and alphabet practice all rolled into Letter E fun. Up next in our weekly alphabet study is the letter E activities. This week my daughter was under the weather, so we kept our letter E activities easy and quick. We still managed to have fun and practice hand writing, letter identification and some gross motor fun. To start our study of the letter E and a week of fun activities, we read the book An Extraordinary Egg by Leo Lionni. We talked about how the word egg starts with E. Then I showed my daughter what an E looked like in the book and we searched for other E's. I made sure to pick a book that matched the picture that we would create next for our alphabet art book. We also found a version of this book being read on YouTube, so she watched that while I set up our art book page. For the alphabet book we are working on, we added E is for egg. We decided to create an egg using crayon resist. She colored on the egg with a white crayon and then painted over it with watercolor paints. The alphabet book is part of my Alphabet Centers with Real Pictures. To practice writing the letter E, I put our alphabet tracing sheets in a reusable plastic sleeve and gave her a dry erase marker. She LOVES this part each week and asks to do it multiple times a week. We usually leave it sitting on the kitchen table with the marker and she will sit down and work on it randomly throughout the week. For some fine motor practice, we used some candy corn to make the letter E. It didn't really have anything to do with the letter, but it was seasonal and she liked using it. The ABC sheets are part of our Alphabet Centers with Real Pictures. She picked each piece of candy corn out of the bag (practicing her pinch and grab skills) and lined them up on the letter E outlines. For a little sensory fun, we pulled out our orange kinetic sand. If you've never played with kinetic sand, it is SO MUCH fun. It is sand but also similar to silly putty in that it sticks together more and can almost drip out of your hands. It can still make a mess, but unlike regular sand, kinetic sand sticks together better and is easier to pick up since it sticks to itself. I threw in some empty plastic Easter eggs. She used the eggs to scoop up the sand and then we used the eggs as molds and made "sand eggs." To review the letters we've covered so far, we used our animal puzzles from our Alphabet Centers with Real Pictures. She still is not to the point of sequencing the letters and knowing what letter comes next, so with these puzzles she uses the pictures to help her put the puzzle together. For a little gross motor practice, I made sticky notes with all of the letters we've learned so far, both upper and lowercase. I put one sticky note in each square tile on our kitchen floor. I would call out a letter and she would jump to it. We kept going until we practiced all of the letters.